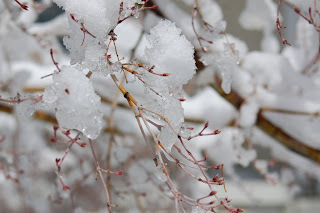 April 5th and it is NOT SNOWING. 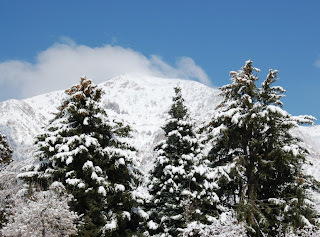 It has snowed, yes, that cold white stuff 10 out of the last 14 days. A couple more pictures, I think the last of the season. 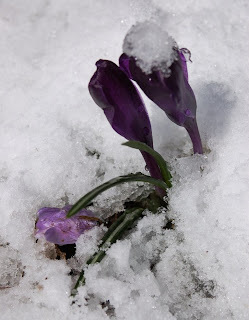 I thought it was funny how the little bulb flowers pushed right through the snow. It is supposed to be 90 degrees today in Orlando, where Janice lives. Janice is on here way to Ohio, where her oldest daughter will be giving birth to her third child today or tomorrow. It's a boy. Good luck Carolee. 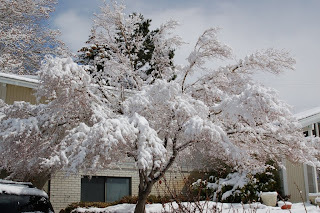 I am hoping these are the last of the snow pictures this season, but they were so beautiful, I just had to share. Nothing could chase away the snow better than a sunny ABBEY BAG. 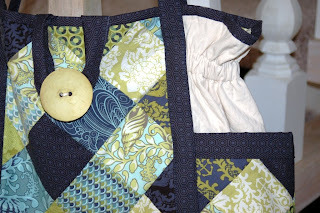 Everytime I find a new fabric collection I love, I make an ABBEY BAG. This one is my favorite yet, made out of Moda's Wonderland. This has been a busy couple of weeks. 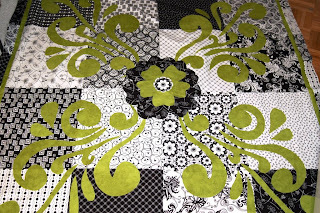 We have teamed up with STUDIO E FABRICS, www.studioefabrics.com to do some quilts for Spring Market. Their booth was down the way from ours at Fall Market and we fell in love with their fabrics. Beautiful, sophisticated, and a touch of whimsy , just our style. 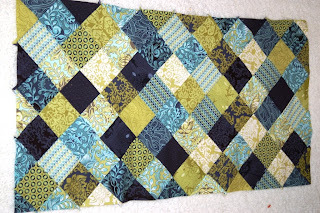 The first quilt is done, actually, it is a remake of Lady Madonna. 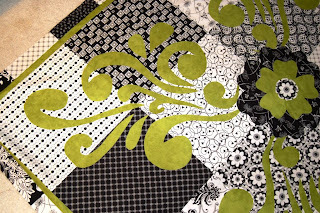 Studio E has not one, but TWO black and white fabric collections and we combined those with a bright apple g reen. This will be hanging in their booth in Pittsburg. We will also be doing one with black and white and red for our booth. They are just stunning. 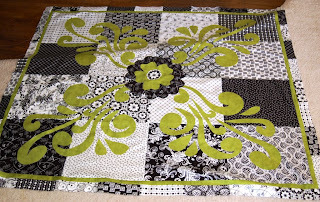 We are doing three more quilts for Studio E. We will keep you updated. I have been working on and off for several weeks on a new bag design. I started with 3 inch squares from TULA PINK's NEPTUNE collection. 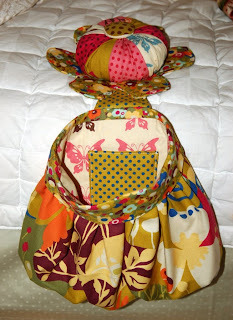 I put them together to make a big piece of fabric and then of course, cut it apart again. Side Note: I have tried to explain "piecing" a quilt before. Think about it. 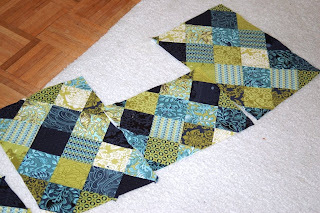 You take big pieces of material, cut them into tiny little pieces, then you sew the little pieces back together to make one big piece of fabric. There are a lot of men who just don't get this concept. The pattern will be available soon. Tell us what you think and we will let you know when it is ready. Thanks reading. Am I really the first person to see these beautiful projects? I like the colors of the Abbey BAg. The Clarabella bag is the kind of bag I like, big and roomy. Only thing I would miss when using it... It doesn't close properly on the upside and as I always throw my bags around, I would most definitely loose a lot of things out of this bag. Jantine, thanks for your comments. The Clarabella bag actually has a strap that wraps from back and around the big button to hold it closed. We will get better pictures showing that and i hope that helps hold everything in. I absolutely love it! 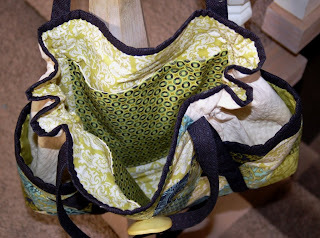 That would come in handy right now because I'm toting around diaper bag stuff AND my stuff in an over-sized hobo bag! I love Clarabella. I am ready to make myself a new purse. Do I see Clarabella in my future? Also, I sooo agree about the cutting the fabric up and then sewing it back together. They just don't get it!! If you don't stop making such cute bags I'm going to run out of space to store all of them. Love the Clarabella bag. I am becoming a fan of big bags again.... I've made two Bungalow Bags now, for my daughter-in-laws, and they love them. My daughters might decide they want Clarabella to keep up. 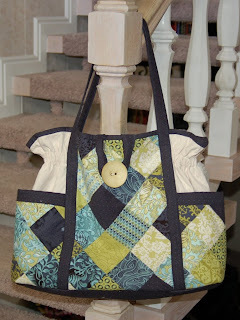 I like the button closer on the Clarabella, the bag is deep enough to keep everything in.